“Nor Arf ” I replied in my best Fluff Freeman voice . “But we need the finest minds in pop to get on board and give their wise and sagacious views on some hot new grooves pop pickers!” Sadly they where all booked up, but we did get together a panel of experts who know a thing or two about pop, some can even carry a tune ! Fran – Hailing from Italy, Dame Frannington likes her music and regularly decrees what is good music and what is bad by use of her thumbs. Like a Roman Emperor really. Or The Fonz. Elz – Has a liking for Scottish bands, she writes reviews and can often be found scouring the Internet for new and exciting music. Shes no fan of broad beans though. Or fruitcake. Spencer McGarry (Prononced McGuigan) – Spencer is singer and guitarist with Spencer McGarry Season, hes from Cardiff , which is why McGarry is pronounced McGuigan- I call that phonetic rebelliousness, still he’s a nice bloke and hes got some cracking songs here. He was late for the review, no harm done we all get hangovers. . Spencer is gigging with Pony Up soon, but I’m not jealous , no not one bit, not at all…. SPENCER : Mid paced fuzzy sound showcasing the thick effortless tones of Gruff’s s impeccable voice- he should get more credit as a singer. Personally I still hark for the experimentalism and excitement of Gorilla although I only say that because I know how astounding they can be- otherwise this song is fine. FRAN: Not too bad, but not too great either, A bit too shouty for my liking. ELZ: This isn’t my thing at all. I thought it might be, once I got past the beginning, but it turns out to not be at all. I enjoy melodies. The melody in this song is being hidden very well by their singer. Thumbs down. DOGWOOD : Now settle down. I don’t know who Jake Summers is and I don’t know what he’s done to deserve such a relentless barrage of the senses and frankly life’s too short. All I can say is you must have done something bad my lad. It starts quite innocuously, a lass starts singing and then it gave me a headache. This may sound more acceptable in the hands (or mouth) of someone like Boney M, who could always do justice to quite bizarre concepts. LAURA : I’m good friends with these gorgeous Irish monkeys, they are the funnest kids on the block and this song is actually a stroke of pure simple genius, it has everything, absolutley everything I could want in a song. The lyrics are witty, completely addictive and brilliant, from ‘hey you , get some grace, you’re like kentucky fried chicken but without the taste!’ to ‘hey baby I’m the bedroom king..I’m so sorry for breaking your ding-a-ling-a-ling!’ It gets me in some kind of orgasmic fit. The melodies glide around, there’s huge hurricanes of keyboards (there are NO guitars in this band! ) and goes from being totally crazy and rock n’ roll to bed wettingly heartfelt in a snap second . May Kay is a complete superstar, she performs this song with so much passion and should be an inspiration to all us frontmen/women out there, an amazing song. WOOHOOOO! SPENCER: Now this is great- good melody,I like the barking. Also the drums don’t come in where you’d expect- sounds like the Pixies with some light Iron Maiden guitars- still can’t work out that bass- worth a few listens- also like the line about giving Karma to the farmer- they make it work- but it shouldn’t on paper. DOGWOOD: Oh dear, oh dear oh dear oh dear. Now I know this lass, not personally like but I am aware of celebrity status and I have to say that watching this video the words ‘trying too hard’ sprung to mind. Let’s be honest, she’s a nice lass who wants to be a bad girl, can’t quite pull it off and ends up looking like a stunt double for that loud mouthed American harridan Madonna. Don’t do it lass, go back to singing about lollipops and locomotions, or whatever it is that you do. The video is an unconvincing cacophony of lads in quifs, slightly odd looking boy/girls in make up. I’m no Noel Edmonds but even I know that this looks and sounds like a cheap Christmas bauble. MR LION : My love of Kylie goes back a long way. While I admit there’s a bandwagon that got moving when Spinning Around was released, and also a sympathy embargo on anybody who has a harsh word to say about a woman who survived breast cancer, it’s worth noting that her career has been a rocky one and it’s something of an achievement to still warrant such positive attention after so long in the cold light of the music industry. I think this is a brilliant track and yet another welcome change in direction for both her sound and her image. I’m not naive enough to think that this is in anyway Ms Minogue’s own doing; I’m quite aware that there’s a multinational marketing machine behind her and a manufactured corporate image. With that in mind, the video really is an exercise in style, which isn’t always a bad thing in pop promos. The lady herself looks fantastic, as always, and I personally like the hair and makeup and costumes. It’s fairly unmemorable though, and I’m sure the song will live with me much longer than the video does. Thumbs up again then, and thank heavens this didn’t turn out to be a cover of that old Phil Collins song of the same name. Good grief, have I really mentioned him twice today? FRAN: I like it when she tries something different from what she did in the past. (Then again, I’m one of the very few people who liked her ‘indie’ record from 1997. ‘Some Kind Of Bliss’ and ‘Did It Again’ were fabulous. So underrated.) This one is a grower. A bit Goldfrapp-ish, both track and video. LAURA: Kyleeeee does rock! Err no…yet again Kylie does a Madonna…by reinventing herself and getting some more botox. Great outfits and stuff and it is a beautifully presented pop package but there always seems to be something desperate and contrived about Kylie, like there’s a bunch of other people telling her how and what to sing and what to wear (shock shock horror!) where as Madge is quite obviously the mastermind behind herself and is completely in control of EVERYTHING she does and will always do this kind of thing better. But who cares? its pop and the song is flawless in terms of production and is a safe bet for a number one. Maybe I’m just jealous of her black and silver catsuit……drool…………..
Well thanks to all the reviewers, Laura, Mr Lion, Fran, Elz, Mikey,Spencer and of course Dogwood it looks like Those Dancing Days is the winner this time round, I wonder what the readers opinions are …..until next time …keep your feet on the ground and reach for the stars ….I’m off for a nice cup of a certain milky malted bedtime drink…….. 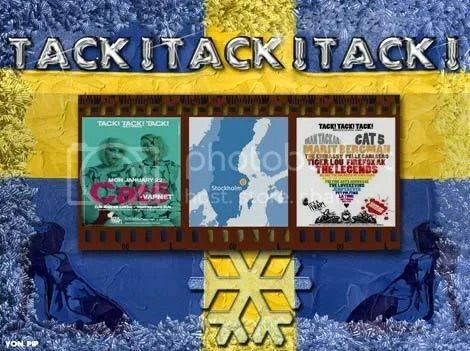 The Swedish Invasion – Tack!Tack!Tack! Back to the Swedish invasion ! Today we turn our attention to the promoters of Swedish music in the UK . Tack!Tack!Tack! is a club – the filter for Swedish music and bands in London. Run By Nick and Jason they have put on (aside from their own Cardigans) some notable Swedish names such as first appearances in the UK for The Tough Alliance,Marit Bergman, The Honeydrips, and Maia Hirosawa. 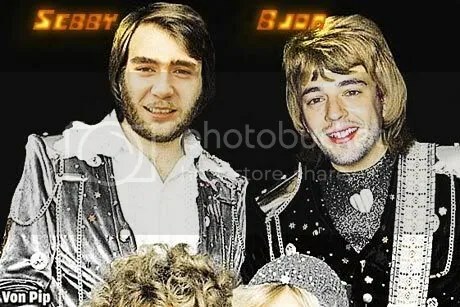 They also virtually discoverd Those Dancing Days, and with the help of a rather handsome yet modest fellow with a rakish moustache, they helped create a huge buzz for the young ankle biters (TDD’s) who have recently signed to V2 (Sweden). Nick Levine stopped watching “The Seventh Seal”, eating meatballs with ligenberry sauce and shopping at Ikea to speak to us and tell us what Tack!Tack Tack! is all about …. VP : T! T! T! – How and why did it start, come along now don’t be shy ? NL: Two years ago at the John Snow pub in Soho. Me and Jason had met two years previous to that at a David & The Citizens concert which he was putting on. The aim of T!T!T! has always been to put on export-ready Swedish artists irrespective of genre. VP: Which bands have you had playing or discovered ? NL: I think we must have put on around 25 different bands on by now. T!T!T! isn’t really about “discovering” bands as the artists we put on are already very well-known in Sweden. It’s more about cherry picking artists we feel are ready to play in the UK. Probably the most revered performer we have had down is Marit Bergman. Another favourite has been The Tough Alliance, more for the sure cheek of their live performance. And we love the Cat5 girls. One of them lives in Mile End now. Sounds like she could be the inspiration for a Pulp song circa 94. VP: What do you think it is about the Swedes that make them so adept at writing pop music , and providing high quality flat pack furniture at a reasonable price? NL :I think that Swedes are very good at copying other genres, in a way sometimes more superior to the original influences. Also, the Swedish government has all kinds of grants to enable people to learn musical instruments. To boot Swedish music is frequently used to promote their culture overseas. VP: What have been your musical highlights of the year ? NL: It was amazing putting on a sold out Shout Out Louds gig at The ICA. We got Andres Lokko to DJ, the best-known music journalist in Sweden. And we had print ads in The Guardian, NME, Time Out and even made the front page of Popjustice. We felt famous for oooh…. 5 minutes ? And of course Kleerup/Robyn’s With Every Heartbeat smashing the UK top 5. We predicted that it be this summer’s big hit in Ibiza before Christmas. VP: What do you think of the current UK music scene? NL: As we both live in London I guess our view is London-centric in terms of going out to gigs and stuff. I think the current scene in the UK is alright but it’s a bit rubbish how so much of it is based on hype. But I think we’re going through a pop revival, which is great. Pop is the new indie. All genuine musicians now want to make pop music. VP: What are your musical tips for what remains of 2007/ the start of 2008? Ida Maria, Boat Club, Air France, Those Dancing Days, You/Me. NL:The first thought which comes into my head is that back in 2002, whilst residing in Brighton, I was dating a Swedish girl who had to lodge in a family home.. It was during the time of the World Cup, and the father of the house had a tiny Corinthian figure of Sven on top of the TV which he thought would make her feel more at home. It didn’t. She just ridiculed it. NL: Bit hard that isn’t it ? Sweden, home of Abba, flat pack furniture, Ingmar Bergman, Sven Goran Erickson and rude films. But did you know that behind the USA and the UK, Sweden is the worlds 3rd biggest exporter of pop music? Bands such as The Hives, The Sounds, Caesars, The Wannadies, Those Dancing Days, I’m From Barcelona, Peter Bjorn And John, The Honeydrips, The Knife, Marit Bergman, Hello Saferide, Bille The Vision And The Dancers to name but a few have helped to elevate the profile of Swedish music considerably in recent years. Yes, it certainly does seem that Swedish bands are invading the UK en masse , armed with great pop tunes , talent and plenty of style. Surely this can only be a good thing and help save us from drowning in the morass of manufactured “X Factor” cabaret shite and radio friendly corporate rock (such as the spectacularly average Razorlight).